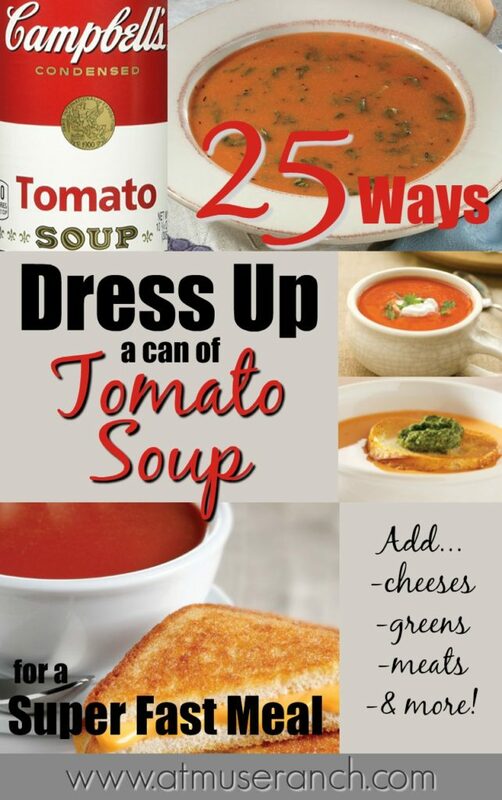 When I was a kid, canned tomato soup was a staple and about the only way my mom dressed it up is by substituting milk for a can of water. Of course, Mom always made sure we had something else hearty to go along with that hot bowl of soup, like a gooey grilled cheese sandwiches. Those were good memories. I’ve been finding this old standby is making a comeback. Mostly it’s been a time factor for me. As in, super quick, get the meal on the table in 15 minutes or less. Oh, and make it yummy! 1. Mix in salsa, add a dollop of sour cream and sprinkle with broken tortilla chips a taco soup-like inspiration. Or you follow Campbell’s recipe below. 2. Sprinkle with diced pepperoni and grated mozzarella cheese for a soupy pizza party. 3. Add thinly sliced garlic and basil as you are warming up the soup. Top with croutons. 4. -Top with crumbled bacon and chopped hard cooked eggs. Make cheese toast. 5. Add a can of stewed tomatoes for a chunkier soup. Use a wooden spoon to chop up the tomatoes. 6. Or give it an Italian twist with a can of Italian-seasoned diced tomatoes and chicken broth. 7. Add parmesan cheese & oregano (fresh if you have it, but a little dried is okay while you’re warming the soup up. 8. Mix in a can of diced tomatoes, along with some fresh dill while cooking your soup. Served chilled in the summer. 9. Get spicy with some pepper and crap meat. 10. Add a handful of leftover cooked pasta. 11. Place a slice of gorgonzola cheese on top. Pop into the microwave to melt. Yum! 13. Top hot tomato soup with Monterey Jack & jalapeno slices. 14. Sauteed mushrooms and sprinkle onto soup along with some sliced Brie cheese. 15. Add some sliced spinach and call it tomato Florentine Soup. 16. Cook with cream cheese for a super smooth and creamy soup. 17. Toasted slice of French Bread sprinkled with mozzarella or parmesan cheese. 18. Spice it up with sriracha sauce for a Thai inspiration. 19. Add a spoonful of pesto (store bought is okay) and sprinkle with a few pine nuts. 22. Add a scoop of rice in a bowl. Pour a serving a tomato soup around the rice and then top with Thai Curry Sauce, red or yellow, your choice. 23. Serve with a slice of fried polenta topped with parm cheese. 24. Serve bowls of soup with poached eggs and your favorite sauteed greens for a quick shakshuka. 25. Of course, the classic, good old tomato soup with a side of grilled cheese. Lip-licking good. If you’ve forgotten how to make a perfect grilled cheese sandwich from my favorite chef… Alton! Take a look at this. 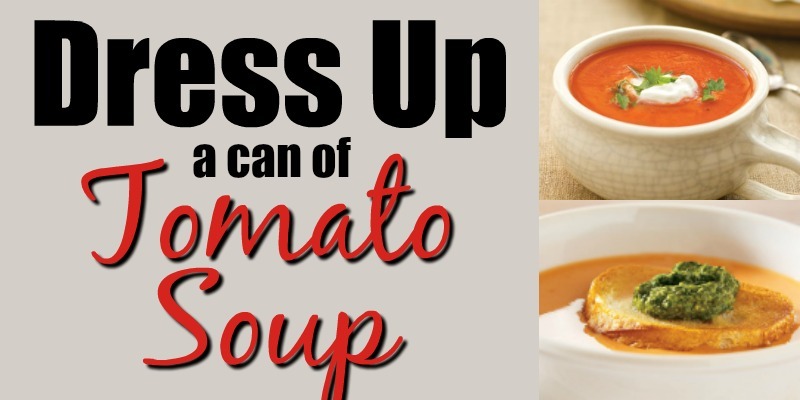 Don’t forget, you can add also dress up you canned tomato soup with all type of crackers, from fish-shaped ones (kids love those) to your favorite butter, cheese or multi-grain. It’s all good! Don’t forget to shop your favorite Campbell’s soups at the Amazon Pantry. Be sure to stop by At Muse Ranch again for more inspirations.